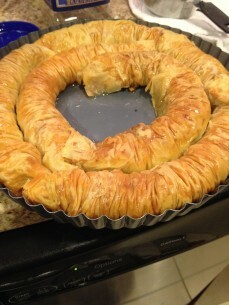 Straight rolls or spiral, your baklava will be wonderful for the next 3-4 days and really I think is often even better the day after baking than the day of! Toast and finely chop walnuts. Set aside. Warm tahni, lemon juice, sugar and cinnamon over VERY LOW heat. Stir until mixture becomes a thick, dark brown paste. 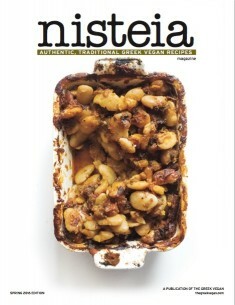 Add sugar/tahini paste to chopped walnuts, incorporate completely and stir in lemon zest. Filling can be made up to 2 weeks ahead. Open filo sheet package and lay stack vertically on top of slightly damp kitchen towel with sheet of plastic wrap on top. Using sunflower oil or a light olive oil, very lightly brush filo sheet and evenly scatter nut filling across oiled sheet. Use approx 1/4 -1/3 cup of nut filling per roll. 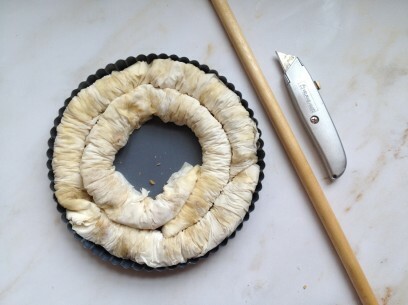 From the bottom end, fold over about an inch of the filo dough and lay dowel across the folded pieces then gently roll up over the nut mixture to the top of the filo sheet. Set rolled sheet aside at top of stack of filo sheets and lightly brush new filo sheet with sunflower oil. Roll the new sheet right on top of the roll containing the nut filling. Firmly grasp the dowel at each end of the rolled filo sheets and gently push each end toward the center in order to bunch up the filo roll. Go slowly so you’re folds are evenly distributed. 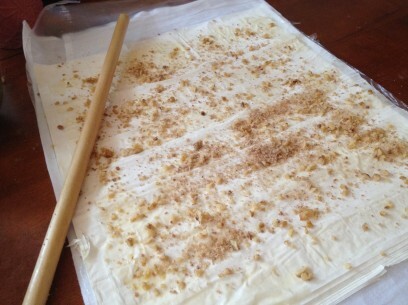 Hold dowel over the parchment lined pan and carefully push/nudge bunched roll off dowel and into pan. Your finished 12-13 filled/bunched rolls should be just about 8-9 inches long and fit perfectly into 2, 9×13 inch baking pan. 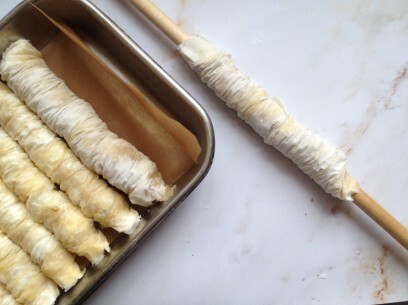 Lightly brush the tops and sides of each roll with sunflower or light olive oil and score. Scoring simply means to cut just through the first layers of fillo dough with a very sharp knife or razor blade. Bake for 40 minutes at 350 degrees until golden. Combine syrup ingredients in small pot and boil for 5 minutes. Pour syrup directly over top of your still warm saragli, give them 15-30 to soak up syrup and serve. We are from Florina, Greece. 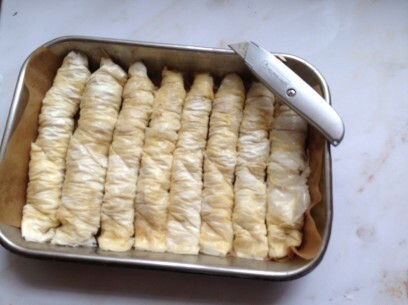 When my awesome Mom was alive,she made the best filo from scratch. Do you have a filo recipe you could share? Mmmmm….thanks for sharing! I will try this. mY MOTHER IS FROM FLORINA ALSO. IT’S JUST FLOUR AND WATER AND PINCH OF SALT. MIX WARM WATER TILL DOUGH DOESNT STICK ON HANDS, MAKE DINNER ROLL SIZE BALLS . OIL THEM AND COBER FOR COUPLE HOURS. ROLL EACH BALL OUT TO THE SIZE OF A ROUND PAN AND THEN PULL DOUGH BY HAND AROUND TABLE TILL ITS THIN AS A SHEET, SPRINKLE WITH OIL OR BUTTER, NUTS, CHEESE OR WHATEVER YOU WANT TO MAKE AND PULL THE TABLECLOTH OR SHEET TO ROLL. 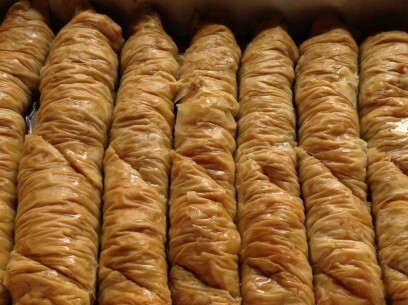 It’s interesting that the rounded style of baklava originates with the Greeks from Constantinople. Not only that, but the coils are often easier to work with, but only if they haven’t dried out. 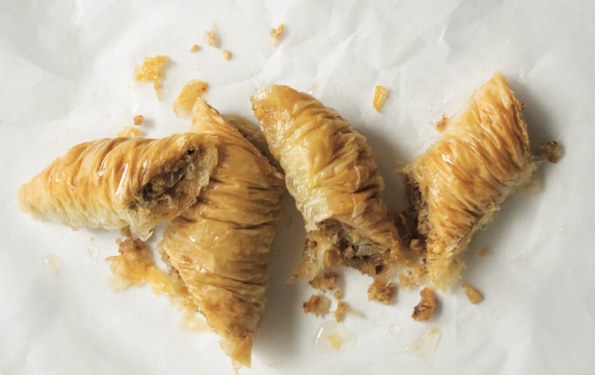 This particular method for making baklava makes it especially easy to work with homemade phyllo. This is VERY exciting! I’m from the UK, a vegan and a real Greekophile. I’ve just taken the Baklava out of the oven, all golden and crispy and I’m now boiling the syrup. We’ll eat them tonight and I shall let you know how it goes. I’ve not visited Greece since becoming a vegan three months ago, but as a vegetarian I’d enjoyed Greek food for years and with relish! It’s SO good to have found you… hurrah!